Champagne corks popped Friday in Moscow as Russians celebrated the start of Donald Trump’s presidency, confident of better relations ahead between the two countries. 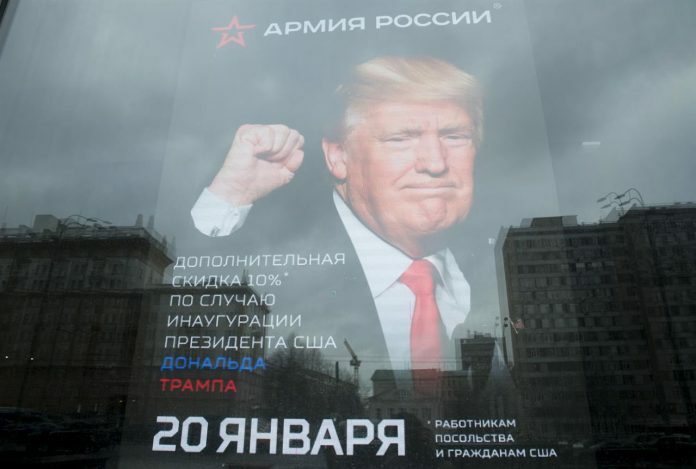 “It’s weird, but it’s great, and for the first time ever Russians are applauding the victory of a U.S. presidential candidate,” political analyst Stanislav Byshok said. Trump’s promises to fix ravaged relations with Moscow have elated Russia’s political elite following spiraling tensions with Washington over the Ukrainian crisis, the war in Syria and allegations of Russian meddling in the U.S. election. “We are ready to do our share of the work in order to improve the relationship,” Prime Minister Dmitry Medvedev said on Facebook. “I’m happy for all Russian hackers,” said 27-year-old IT professional Filip Nikolsky, who wore a sweatshirt with the “You’ve Been Hacked” slogan. Still, the mood at the party in downtown Moscow was subdued compared to outbursts of joy at the news of Trump’s victory in November. Trump’s praise for Putin has raised expectations that he could move to normalize ties, although Trump hasn’t articulated a clear policy and some of his Cabinet nominees have made hawkish statements on Russia. Leonid Slutsky, the head of the foreign affairs committee in the lower house of parliament, expressed hope that Trump will move to establish constructive ties with Moscow, but cautioned there is no “magic button” to instantly achieve that. “We expect a slow but steady revival of our relations,” he said. “Difficulties will remain,” he said.